This is the second in a series of blog posts from Whitties studying on Whitman’s Crossroads: Rome, Italy: Landscape and Cityscape in Ancient Rome program this summer with Professor Kate Shea. Amanda Li ’19 is a Biology-Environmental Studies Major. 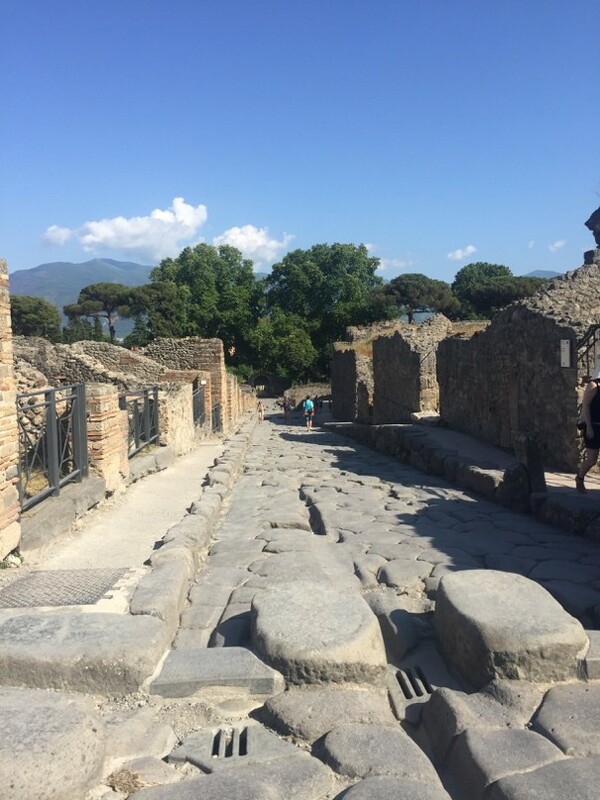 Today, Sunday June 10th, we visited one of the most iconic sites of Italy: Pompeii. Accompanying us was, of course, our IES companion, Eduardo, and our tour guide for the day, Francesco. As an animated and cheerful guide, Francesco walked us through both the Villa Oplontis and Pompeii as he told us of their destruction after the eruption of Mount Vesuvius in 79 AD. Villa Oplontis is an ancient Roman villa, which is thought to have belonged to Emperor Nero’s wife, Poppaea, when she was not in Rome. Because the earthquake in 62 AD caused enough damage that the villa would need to be renovated and repaired, this area was less populated than usual. This residence was not excavated until 1964, allowing for many of the absolutely beautiful frescoes and mosaics to be better preserved than in many of the other places we’ve visited–Mamma mia! We certainly got a sense of what this imperial villa may have looked like in ancient times. Pompeii was once surrounded by 2 miles of city walls with 14 watch towers and only 7 entrances. However, once it was conquered by the Romans in 300 BCE, these walls were torn down and suburbs were built outside the walls. 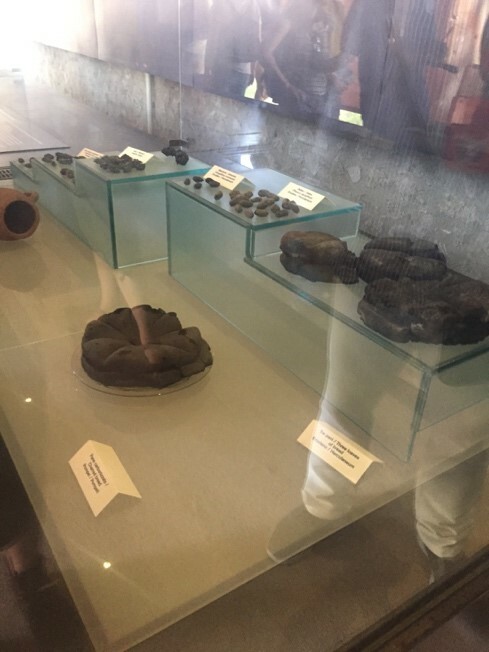 Some of the most interesting things we saw there, in my opinion, were the special exhibitions that were open which included plaster molds of victims of Vesuvius and carbonized foods that were found in the ruins. The plaster molds were created by detecting hollow spaces in the layers of ash, rock, and pumice. When citizens of Pompeii died in the eruption, usually from asphyxiation, their bodies were then covered in layers of ash, pumice, and rock that were still being expelled from the volcano. Eventually the debris hardened around the bodies, and as the victims decomposed, a hollow space was left in the layers in the shape of their bodies. Modern archaeologists were then able to insert two pipes into this space and pour liquid plaster into the hollow space through one of the pipes. The other pipe was to allow the occupying air to escape as the plaster displaced it. After allowing the plaster to harden, archaeologists would excavate this mold (with the bones inside which can still be seen on a few of the molds) which could be studied and displayed. This technique is less common today because archaeologists would like to study the victims’ bones which cannot be done once the molds are made because the plaster disrupts the chemical composition of the remains. Some of the carbonized food found in excavations included dried figs, walnuts, and even bread. The loaves of bread could be distinguished because of the 8 portioned sections that made them easier to separate. 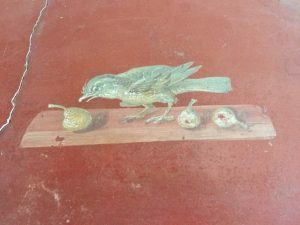 Bread is still made this way in Rome – we saw some in the Jewish Quarter! All of these pieces presented us with a snapshot of life in Pompeii in 79 AD and a hint as to the extent of the devastation caused by this natural disaster. 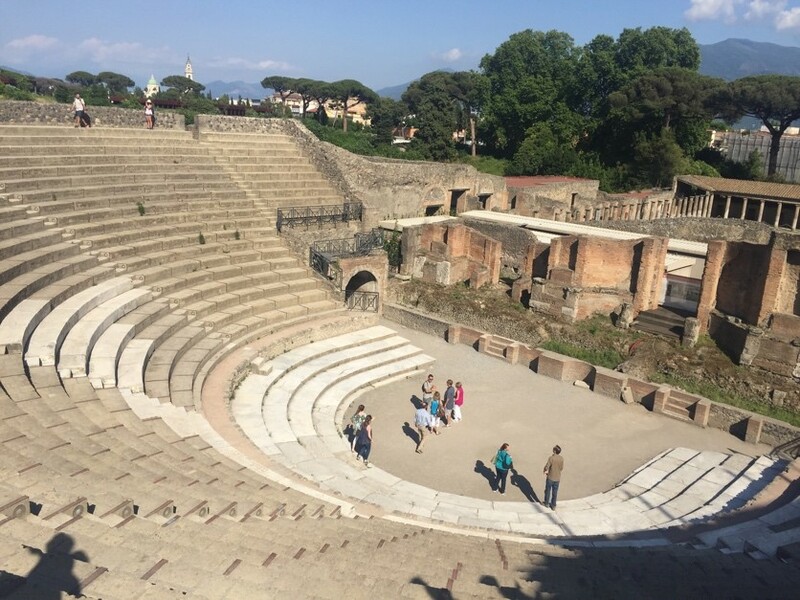 Other notable sites that we saw at Pompeii included the oldest amphitheater that would have had a big canopy overhead to protect its 20,000 spectators from the sun as well as a Greek-inspired theater. While the amphitheater was made for entertainment like gladiator fights, the theater was meant for dramas, comedies, and poetry readings. 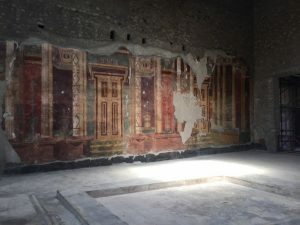 Pompeii also had 48 public fountains, beautiful frescoes primarily preserved in the wealthy domus, grooves in the original streets made for horse-led carriages to pass through, 25 known brothels, original lead pipes for water, and a public bath. All of these sites were found as they were left in 79 AD while the inhabitants fled from their homes. While Pompeii provides an incredible opportunity to catch a glimpse of the lives and habits of real Ancient Romans, it is also important to remember and respect the victims and their experiences during this natural disaster. This entry was posted in Uncategorized on June 19, 2018 by serranvj.